This is said to be (and I'm not arguing) 'the biggest medieval castle in Europe', and it's very impressive. It has everything a castle should have: a moat, towers, halls big enough to dance in, and gardens pretty enough and secluded enough for the courting of princesses! It was once known as Marienburg, headquarters of the Teutonic Knights. 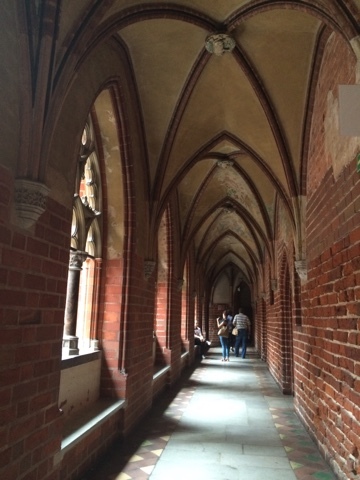 We don't visit many castles but we really enjoyed Malbork castle. 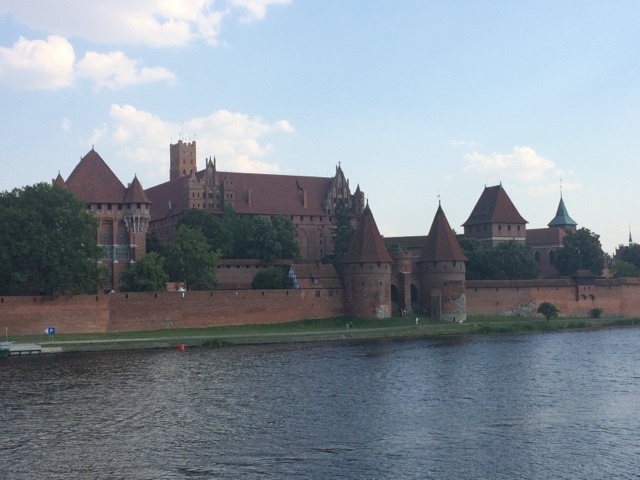 An added bonus for us was that although we arrived in Malbork late in the day (too late to visit the castle and do it justice) there was a campsite across the river (with a footbridge to the castle) and so we could camp with a castle view for about €15. (Although we prefer wild camping, in cities we'd prefer Blac was securely parked while we were sightseeing and so this campsite was good for us). Malbork castle from the footbridge. Marienburg is spectacular inside and out!